This interactive map is unfortunately not available on your device, because HTML5 Video, WebGL or support for large video textures are not available. 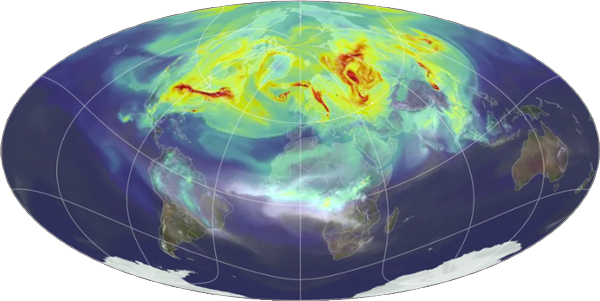 Please use a recent version of Firefox or Google Chrome, or see the original version of the carbon dioxide map at the NASA Goddard Space Flight Center website. This interactive map is currently not available for Internet Explorer. Please use a recent version of Firefox or Google Chrome, or see the original version of the carbon dioxide map at the NASA Goddard Space Flight Center website. To navigate in time, click on the circle on the left. To adjust the center of the map, click and drag on the map. To zoom in and out, use the scroll wheel or the slider on the right. To navigate in time, tap on the circle on the left. To zoom in and out, tap the slider on the right. Read our open access article in the Journal of Maps about interactive video maps and how this map was created. Read more on nasa.gov about the CO2 model. Interactive video map by Bernhard Jenny, Bojan Šavrič, Johannes Liem of the Cartography and Geovisualization Group, Oregon State University. This map projection shows all areas with correct relative size. © 27 Dec 2014, minor updates 8 Jan 2016, 19 Sep 2016, 11 Mar 2017, 27 Nov 2017. Read our open access article in the Journal of Maps about interactive video maps and how this map was created. Your browser does not support HTML5 video. Please use a recent version of Google Chrome.